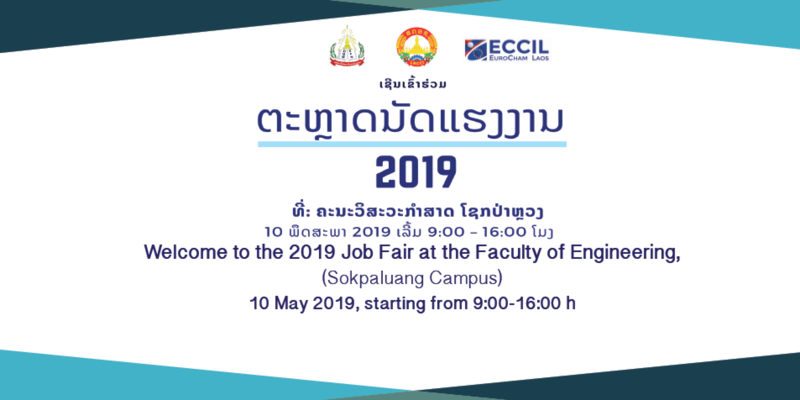 On 10th May 2019 the 8th Job Fair will take place at the Faculty of Engineering (Sokpaluang Campus), Vientiane. This crucial event, originally initiated in 2012 has continued expanding and is co-organised by the Faculty of Engineering, the European Chamber of Commerce and Industry in Laos (ECCIL) and the Lao National Chamber of Commerce and Industry (LNCCI). The main objective of the Job Fair is to bridge the communication gap between the academic world and the business community due to two main reasons. Firstly, there is a lack of awareness among the students on where their studies can take them and which employment possibilities are available on the labor market. Secondly, companies have a hard task to communicate with students in order to explain the contents of jobs or to attract suitable candidates to apply for vacant positions. This year, we expect to have more than 2,000 visitors come from different education institutions such as Faculty of Engineering, vocational schools, private institutions, high schools etc. About 4,000 students are enrolled at ten different departments within the Faculty of Engineering. Among these students, about 1,300 of them will graduate at the end of June 2019. The Job Fair usually attracts about 30 companies and organisations, who have expertise ranging from IT to banking, and even to hydro power. The companies/organisations offer a large variety of more than 70 vacant positions. Besides the interaction with students, many companies get in touch with academic staff of the Faculty to exchange ideas on how to improve the study courses according to the demand of the economy. Besides giving potential employers the opportunity to display their organisation, organisers put a lot of emphasis to offer further attractions, such as a presentation on job interview etiquette tips, a presentation on the preparation for the job interviews and steps in searching for a job. In this context, the companies will repeatedly emphasise how important it is for young Laotians to take over responsibility not only for their own work area but also for the success of the entire company. Furthermore, in this event all students will be able to get advice on writing their CVs effectively in order to increase their chance on the path to the career they pursue.